And if you are facing the above situations or suffering the similar problems, you can get rid of them here. Lots of people feel that video upscaling is complicated and the SD-to-HD or HD-to-4K upscale process either requires complex software or high price tag. But it's not. This tutorial aims to resolve video upscaling issue with simple words, tool, and steps. 1. Fast and easy. Upconvert videos to 1080P, 2K, 4K with simple clicks. 2. 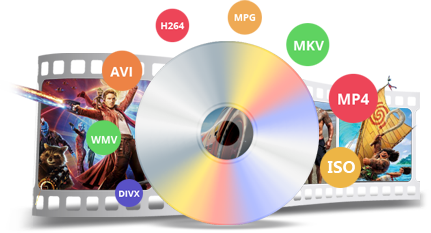 Use advanced video encoder like H265 to improve video quality yet compress the video file size. 3. Improve the video resolution and bitrate to enhance video quality. 4. 300+ output formats and devices. No format incompatibility issue. No complicated steps, WonderFox HD Video Converter Factory Pro is the right tool that is capable of upscaling videos with simple steps. As a superb free HD video editor, this program can edit 4K videos and convert videos from SD quality to HD quality as well as enhance HD videos to 4K videos in a few mouse clicks. Free downloadFree download it here and follow my steps to upscale your videos to luxuriant quality. 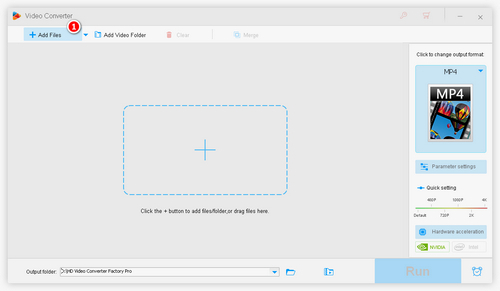 First, import target videos by clicking the “Add Files” button or simply dragging the files to the interface. This tool can upscale videos in the batch mode. I’ll show you 2 simple methods of video enhancement. Method 1: There’s a resolution bar on the right part of the program, you can drag it to the wanted degree, such as drag the slider from 720P to 1080P. Warm tips: The original video quality affect the final output video quality. If the source videos are in SD quality, upscaling videos to HD quality (namely 720P, 1080P) is acceptable. And if the original videos are in HD quality, you can deal with 4K UHD upscale conversion. Method 2: Head to the Output Format section and move up to the 4K/HD part, choose one desired resolution and format. For you who are familiar with video setting, you can change the related parameter on the “Settings”. 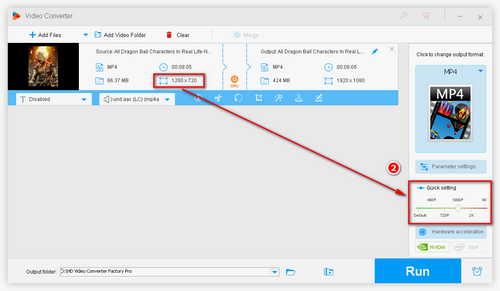 You are able to adjust video/audio encoder, bitrate, framerate, aspect ratio, etc. Click the big blue Run button to start to convert the source videos to the higher resolution. 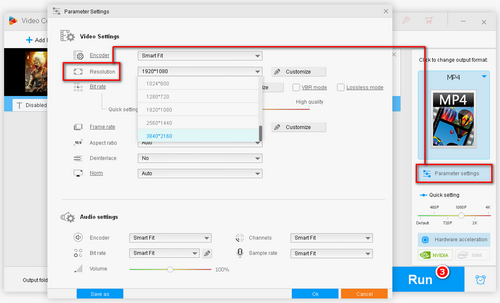 For those who want to upscale the video quality and make the videos playable on devices, you can directly set your device model as the output format on the Device section. HD Video Converter Factory Pro supports to convert videos to HDTV, 4K TV, Apple devices, Android devices, tablets, phones, computers, or help you play video via Chromecast and so forth. So you do not need to worry about the format compatibility issue. Moreover, you can make full use of some online video upscalers. For instance, hdconvert.com is a free site that allows its user to improve the video quality to Ultra HD (2K, 4K, 3D). On its official site [https://hdconvert.com/], hold down the mouse button to the “Convert Video to Ultra HD” part then choose the video resolution you want to convert to. Demerits: This site will take much more time to upload and upscale video to the higher resolution. And it requires payment for downloading to a different video resolution. 1. 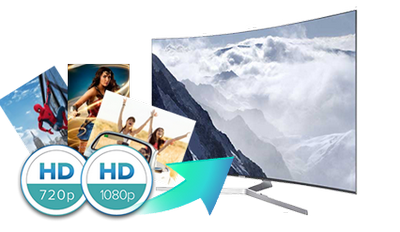 Downscale video resolution: convert 4K/HD videos to standard videos. 2. Insert subtitles to videos or remove subtitle from videos and films. 3. Download high-quality video from YouTube and more 300+ sites. 4. Compress large video/audio/movies files to smaller size without sacrifice the quality. Lots of people would like to convert DVD content to better quality since the video resolution of a standard DVD is 480P. 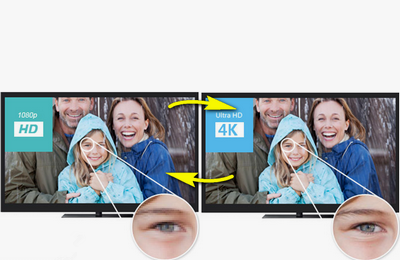 You may want to upscale the quality and resolution to make it match with the big screen like 4K TV. It’s simple, no need to buy the expensive Blu-ray DVD player or other similar tools. WonderFox DVD Ripper Pro can carry out DVD upscaling handily. Free download it here to have a try. How to Convert SD Video to HD with High Quality? How to Compress and Convert 1080p to 720p with Intact Quality How to Compress 4K Video at the Highest Quality?